Skills and Abilities: Proficient hand to hand combatant. Powers: Riot can move at superhuman speeds. Equipment: He has used a small stone hammer in combat. The man who would come to be known as Riot grew up in a troubled neighborhood. When his powers manifested he was contacted by Temple a high ranking commanding officer of G.A.T.E. By agreeing to join their operations Riot was aided in taking care of a a lot of problems back home [Supreme #3]. 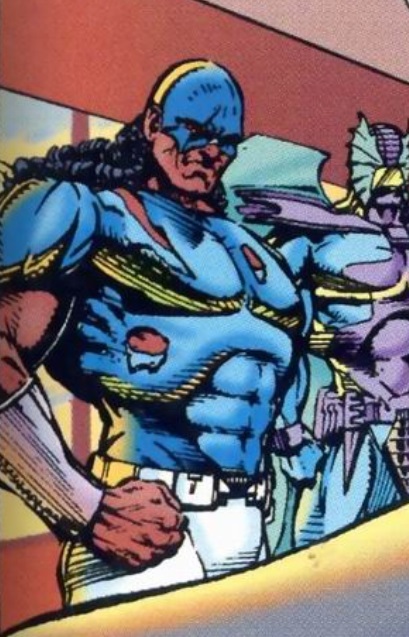 Riot was a member of the superhuman team ‘Heavy Mettle’. They were tasked with protecting the villain Zachariah Grizlock from Supreme who had returned to Earth after years in space [Supreme #1]. When Supreme attacked his ward he engaged the far stronger opponent alongside his team. He was easily dispatched Riot and defeated the team. A truce was called as they explained why they were protecting the villain [Supreme #2]. The team were then briefed by Temple on Supreme. Riot was then accompanied by Menagerie to Temple’s stylist since his costume and look was deemed too 70ish. His new costume was “Youngbloodish” which he hated. He was then drawn into an alliance with Brigade and Supreme [Supreme #3]. Next ‘Heavy Mettle’ faced Khrome in battle alongside Supreme [Supreme #4]. After his team was defeated he was one of only two left standing [Supreme #5]. After this the team was dismantled and he returned to being a street level superhero [Supreme #6].